The first line of defense against infectious microbes is the skin. 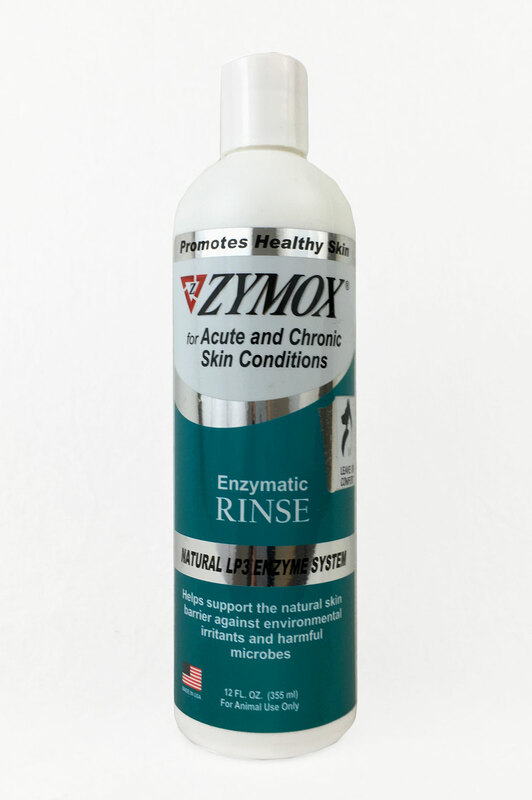 Zymox Rinse produces a powerful protective barrier against minor skin irritations due to bacterial and fungal microbes. Only the mildest plant surfactants are used. Zymox Rinse contains no harsh detergents, pesticides, colorings or residual petroleum products. Recommended for use after Zymox Shampoo. Apply Zymox Rinse directly to wet fur and massage in thoroughly. Leave on to dry for optimal antimicrobial protection or lightly rinse. For severe problem areas, Zymox Rinse may be applied full strength as a cream and left on to dry. Biotin, Cetrimonium Chloride, Cyclomethicone, Lactoferrin, Lactoperoxidase, Lysozyme, Natural Fragrance, Potassium Iodide, Purified Water, Vita-Protein Complex, Zinc Gluconate.